In Good Eats, we strive to serve up the most compelling restaurant news Richmond has cooking. This time, we wanted to explore the most interesting, weird, unique, and one-of-a-kind dishes and drinks: only found at restaurants in the River City. Below are some of our favorite finds, what we thought, and where to try them. While the Shockoe Bottom restaurant draws crowds for its authentic Mexican tacos and elote, it’s their nopales that have our mouths watering. Tio Pablo is one of the only local spots making fresh Nopal cactus, or “Prickly Pear” cactus — which is served after cutting off its spines, slicing it into strips, and finishing up by boiling it with whole black pepper, salt, and garlic. 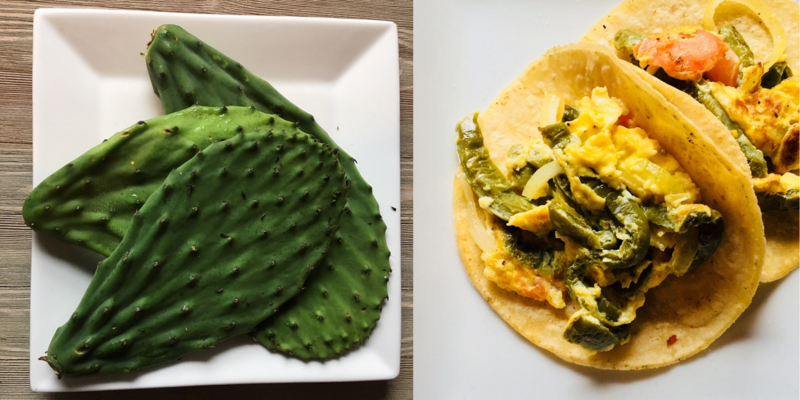 These nopales have traveled a long way to get to your plate. Cultivated in northern Mexico, they are sent to Texas, Georgia, and Maryland before finally landing in Richmond. The finished product has a texture similar to green beans, and a taste closer to okra. “It’s very popular in Mexico,” said Chef Martin Noriega, a native of the Mexican state of Morelos, whose hands are behind the restaurant’s creative menu. Once you try this juicy, tender dish, you’ll know it’s worth the wait. At Tio Pablo, nopales can be ordered in a taco, tostada, or gordita. They are also served on the side with tomatoes and jalapenos, or with scrambled eggs for brunch. 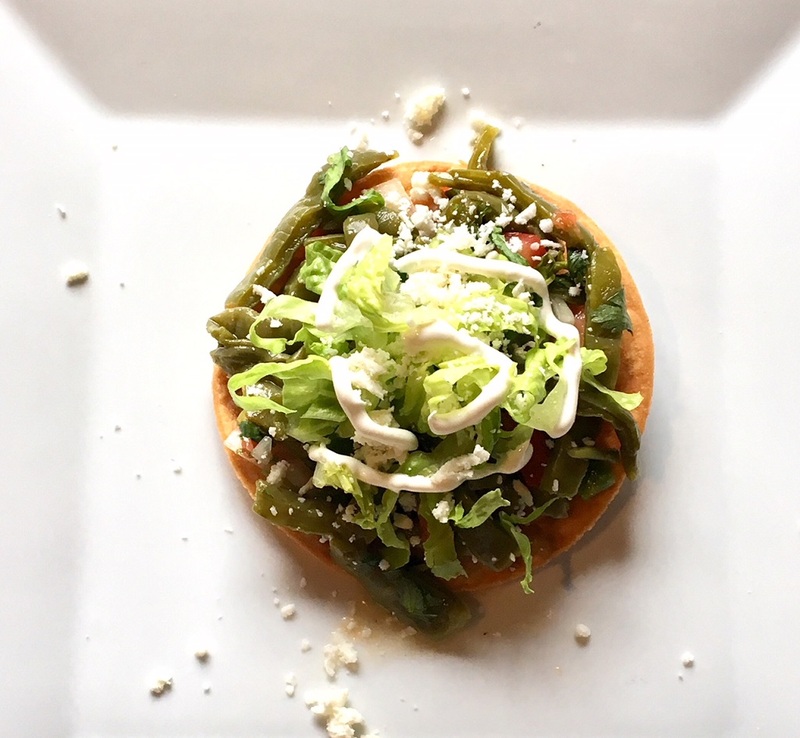 I chose nopales in a crisp tostada, which came topped with refried beans, jalapeno, lettuce, queso fresco, lime, sour cream, cilantro, and onion. The crunchy tostada pairs well with both the texture of the nopales and bite of the onion, and the heat of the jalapeño ties it all together. Top it with one of their homemade hot sauces (like mango habanero or picante with ghost peppers), and you’ll have a spicy, delicious, and filling snack. If you still aren’t convinced, nopales are also high in antioxidants, vitamins and minerals: so next time you have a craving on Taco Tuesday, you can hit up Tio Pablo and crush several tacos without feeling guilty. A few Richmond chefs have incorporated paw paws into their menus in the last few years. What’s a paw paw, you ask? It’s an ever-elusive greenish fruit that tastes like a banana/mango/papaya combo with a creamy, yellow custard-like flesh. 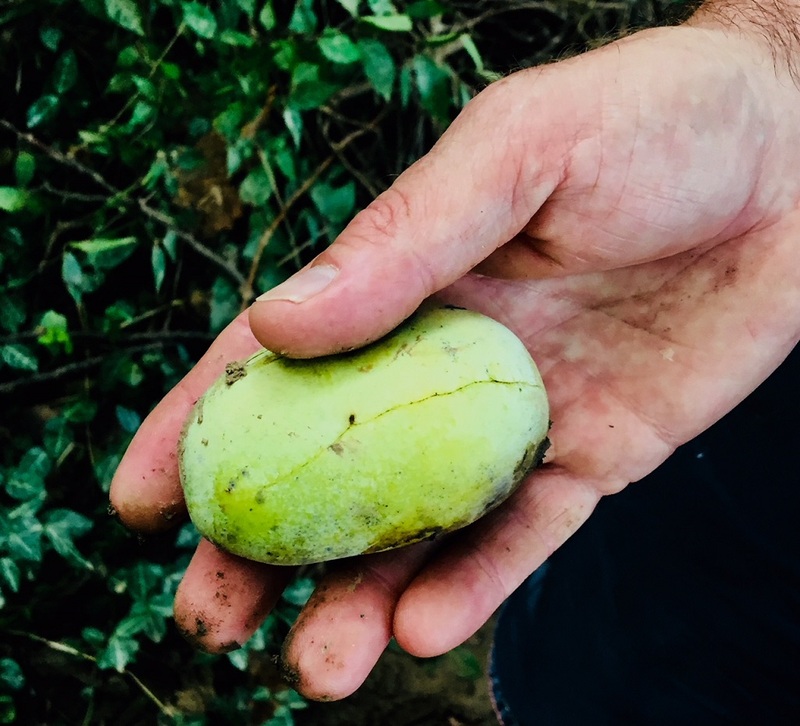 Only in season from mid-August to late-September, it’s the largest edible fruit native to America, and it’s right here on the banks of our James River. In his Phish T-shirt and flip-flops, Shagbark Chef Walter Bundy took me down to the river to hunt for the perfect paw paws. During the brief late-summer season, you can usually find him around on his boat, scouring the river for the fruit (gigantic Ziplock bag in-hand). He showed me the difference between a good paw paw and fruits that are better left for the deer. They need to be soft, but not too soft: if they’re dirty or have a few black spots, that’s okay. We trudged through mud, water, and brush, braving mosquitoes all for a handful of paw paws the laid-back chef can use at his restaurant. Now that’s dedication. This season, Bundy called upon his team to create a paw paw cocktail. 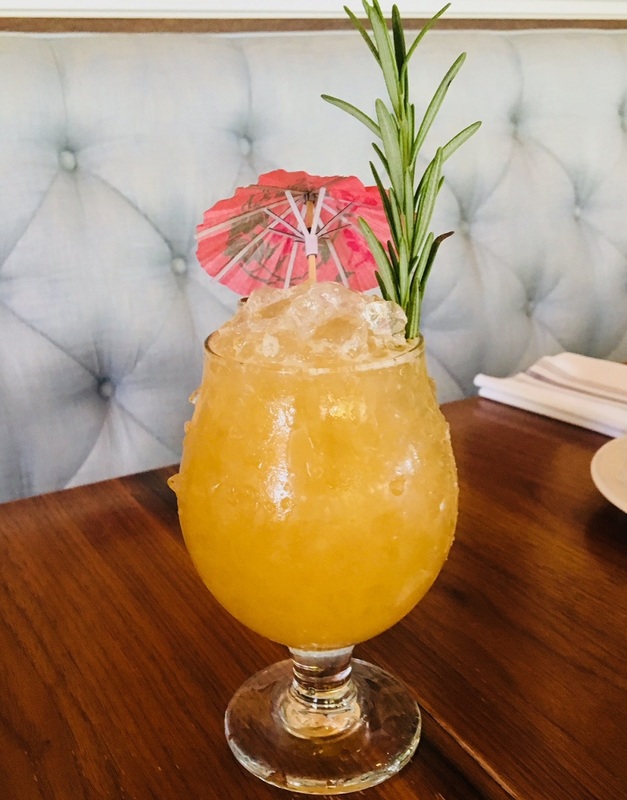 The flesh of the paw paw is finely pureed, then combined with rosemary syrup and blended with Woodford Reserve bourbon, Marie Brizard white crème de cacao, Mahina Coco (a French-Caribbean coconut liqueur), and lemon juice. It’s then poured over ice and finished off with a sprig of fresh rosemary, and a mini umbrella for flair. It is one doozy of a drink. I was immediately hit with the intense, aromatic, fiery bourbon. It would be too much, if not for the citrusy-sweet paw paw, and rosemary syrup which is fresh and light. Combined with the hint of the coconut liqueur, it’s a superb end-of-summer cocktail. No Shagbark trip during Virginia’s brief paw paw season is complete without Bundy’s latest concoction featuring this star ingredient. 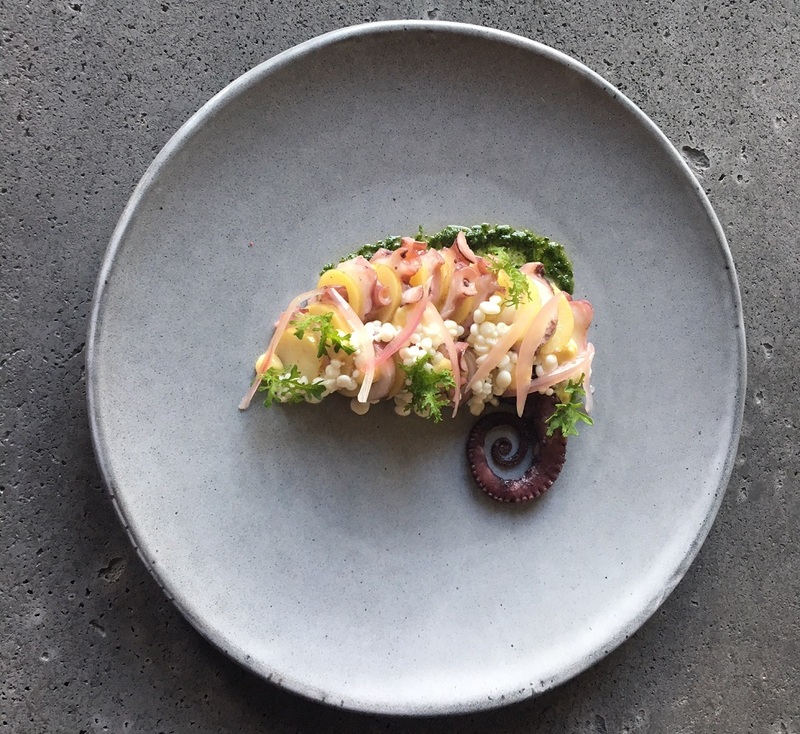 Dazzling everyone with their creative and eye-popping Instagram, Longoven premiered its long-awaited brick-and-mortar spot in Scott’s Addition this June after satisfying hungry diners at pop-ups around town for three years. One dish that immediately sucked us in was the Octopus Salad, which is inspired by a traditional Italian salad using basil, lemon, and potatoes. Refining it to suit their tastes, Longoven has added in egg white pearls, pickled shallots, an herb purée, and topped it with spicy mayo — which makes for a great snack, and a must-try on our list. The octopus is poached in kombu broth (a Japanese stock using mushrooms) and steeped for a few hours. It’s chewy, but it brings a ton of flavor. The egg white pearls, which are marinated in oil and vinegar, provide a unique texture and bring out the taste of the seafood. It’s a small dish, but it packs intense flavor. This one is a refreshing take on a summer salad, and it had us crawling back…tentacles and all. Richmond is home to many Chinese restaurants, but very few measure up to Full Kee. The West End restaurant serves up authentic Cantonese cuisine on Horsepen Road. 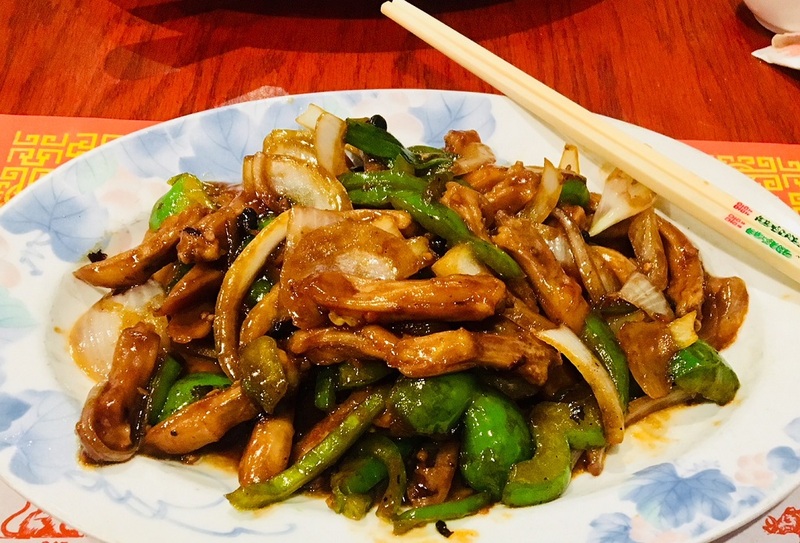 Whether you’re indulging in sweet-and-sour pork, kung pao chicken, Hong Kong-style noodle soups, or weekend dim sum feasts, Full Kee is the best around — and this is coming from someone who isn’t very fond of Chinese food. On my recent trip there, I was after something a little more enticing: the stir-fried duck tongue. Not to take away from their other impressive dishes (like shark fin dumplings, duck feet, and stir-fried frog), but the duck tongue piqued my curiosity. I ventured into their brightly-painted restaurant, adorned with Chinese art and roasted ducks hanging in an enclosed glass case, to try the dish. Served with a bowl of rice, this heaping portion of duck tongue doesn’t skimp on size. It comes with green peppers and onions, and is mixed in a mild-but-flavorful black bean sauce with hints of soy, garlic, ginger, sesame oil, and duck fat. I dove in and took a bite, only to realize there was a bone running through the center. Once I figured that out, I knew how to eat it, and soon discovered that the duck tongue was actually very flavorful. It’s chewy (but not rubbery), and the salty but semi-sweet sauce coats the duck well. It’s not oily or gamey, but don’t expect it to taste like chicken, either. If you’re looking to venture outside your typical order at this Chinese institution, I suggest giving this dish a try. Chef Michael Hall has been filling our souls and bellies with his upscale Southern/French comfort food for two years now at Spoonbread Bistro. 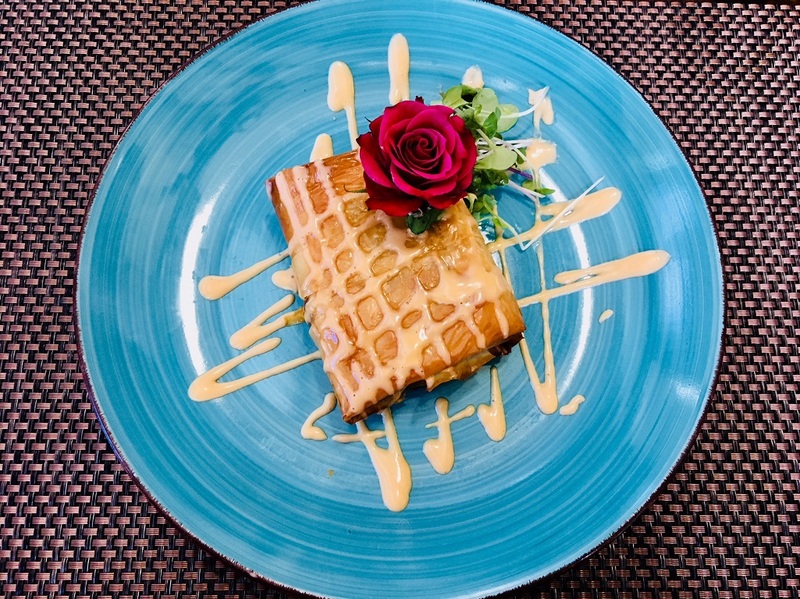 While the Fan restaurant warms a Southern heart with its short ribs, bourbon bread pudding, and pork/collard greens egg roll, it’s the lobster pop tart that had us diving into the unknown. Those two words together may seem a tad odd, but Spoonbread has executed the unique creation wonderfully. Hall’s background as a pastry chef shines through this dish. It has a creamy cheese sauce (similar to a bechamel) atop lobster meat, swimming in a beurre blanc sauce. It’s all wrapped inside warm phyllo dough, and while it’s listed under appetizers, it could easily be a full meal. It’s velvety, buttery, and flakey, and doesn’t skimp on lobster meat or cheese sauce. Like a pop tart, you can’t have too many of this rich, decadent dish: but one is really all you need to be satisfied. From the “Devil’s Mess” omelet at Millie’s Diner to burritos from Taco Bell, countless foods have been recommended as cures for the dreaded hangover. My personal go-to was Gatorade and Advil; that is, until I discovered North End Ice Cream’s sweet, tangy, and tart Charcoal Lemonade sorbet. 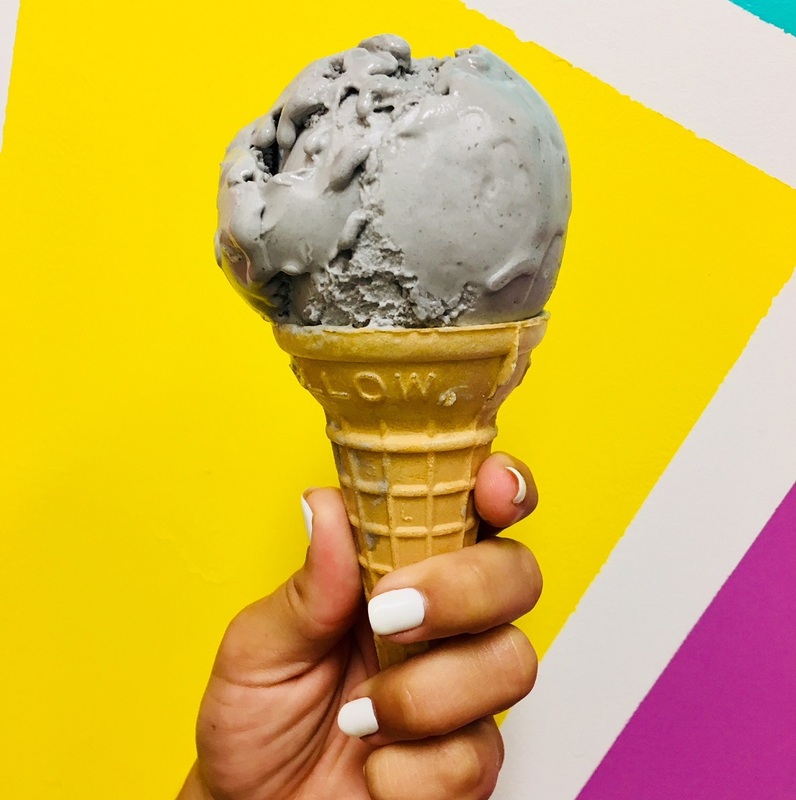 A blend of meyer lemon, agave, activated charcoal, and alkaline powder, this treat may not evoke the pastel dreams that we associate with sorbet — but it’s tasty nonetheless. And when you’ve had too much red wine the night before, a scoop of this gets the job done. North End Ice Cream is located on Cleveland Street right next to its sister juice bar, North End Juice Co., which itself carries a charcoal lemonade drink. But of course, I opted for the dessert. It’s more fun than popping a charcoal pill, or smearing a charcoal mask on my face. Co-owner Channing Miller, who tried to entice me with fellow funky flavors like strawberry basil and funfetti with CBD (cannabis) oil, said the carbon in the charcoal acts as detoxifying agent and works as a sponge to absorb the toxins from your body. Anytime I can eat a dessert which not only tastes divine, but is actually good for my health, I’m game.